Mayor Pete Buttigieg is ﻿capturing the imagination of the country in a way we haven't seen in decades ... and aside from politics, one of the ways he's connecting with voters is through pop culture. The openly gay South Bend Mayor, who is soaring in popularity during the early stages of his 2020 Presidential campaign, came on "TMZ Live" for a lengthy interview, and you really get a sense of what he's all about during our 25-minute conversation. Buttigieg tackles a variety of issues, from how he plans to respond when Donald Trump targets him with homophobic remarks, to the consequences parents like Lori Loughlin should face if they cheat the system to get their kids into college. During his visit, Pete also chats with us about religion, coming out, and Kim Kardashian's role in prison reform. And, that's not all ... Mayor Pete dishes on his fitness routine, downloads us on his favorite music and plays a solid Jimi Hendrix riff when we hand him a guitar!!! 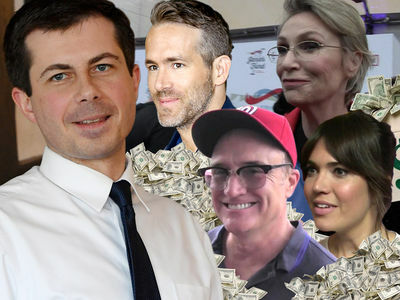 BTW ... Nate Silver just upped Buttigieg's rank in the gambling world ... most likely to snag the Dem nom.